Developing your child's math skills requires a comprehensive curriculum for homeschooling, and enVisionMATH is just that system. Each Grade of enVisionMATH is designed to be interactive and engaging, having children complete activities and learn through visual aids. Grade 3 continues right where Grade 2 left off, ensuring your child experiences a smooth transition from one level to the next. enVisionMATH: Grade 3 will help you plan lessons that introduce math concepts in an easy-to-follow and step-by-step way. Your child will use the visual aids provided by the curriculum materials to formulate a strong math foundation. As you instruct, enVisionMATH: Grade 3 will supply your child with problems that solidify his or her understanding of the concept you introduced. Add using numbers up to 1,000. Understand the differences and relationship between multiplication and division - for instance, 100 divided by two is the same as 50 times two. Find the area of a shape by multiplying its sides. Categorize shapes based on number of sides (i.e., triangles, quadrilaterals and hexagons). Use graphs to solve math problems and understand data sets. 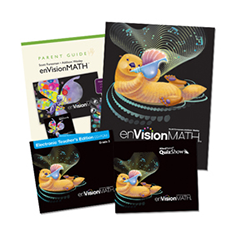 enVisionMATH caters to children who have visual and kinesthetic learning styles. The graphs and pictures help your child conceptualize math visually while the numerous activities and quizzes allow him or her to practice each new idea. Grade 3 is full of opportunities for you to explain math concepts in different ways, ensuring your child fully grasps the lesson. For more information on the numerous components that come with enVisionMATH: Grade 3, take a look at the Features and Benefits page.